All-Terrain Vehicles (ATVs) and Side-by-Sides (SbS) are designed primarily to travel on unpaved surfaces and exist out of utility and recreational vehicles. ATVEA members commit to put safe vehicles on the market which fulfil all obligations of the applicable EU legislation (including specific construction, sound and emissions requirements). ATVEA also actively participated in the development of CEN standards to comply with the EU Machinery Directive (vehicles not homologated for on-road use). However, a crucial factor remains the manner with which the rider uses his vehicle. ATVs are rider-active vehicles (meaning the operators shift their body weight to enhance the performance capabilities of the ATV) which require special skills & training to be used safely. 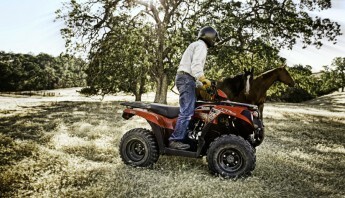 ATVs are meant to perform off-terrain jobs or journeys; they are not meant to be used to perform stunts. Side-by-Sides may look similar to 4×4 cars but they are very different in design and usage. They should not be driven on paved surfaces or public roads except when necessary to access terrain. Drivers and passengers should fasten their seatbelts; respect the maximum load and towing mass as described in Owners’ Manual. In all cases, each rider/operator must have an appropriate driving licence, receive basic training and be equipped with the appropriate clothing (always wear helmet and protective equipment as recommended by the manufacturer). Riders should adapt their speed to the terrain, their load carriage, and observe the national road traffic regulations when driven on open public roads. ATVs & SbS users share the environment with other outdoor activity enthusiasts. In order to maintain an enjoyable and pleasurable coexistence, users must avoid excessive sound levels, minimise their impact on the terrain, respect the natural surroundings and wildlife, and behave responsibly towards other trail users and local residents. Regarding sound, ATVEA would like to stress that only official exhaust systems should be used. ATVEA also points out that users should also take advantage of the wide, low-pressure tyres equipping ATVs and SbS to minimize the impact on the ground. ATVEA members strongly recommend respect for legislations. ATVs should only be used on designated trails, taking into account legislation regarding access to terrain and asking landowners’ permission when using private trails. ATVEA and its members actively promote the safe and responsible use of ATVs and SbS, in Europe and beyond. “ATVEA Guidelines for Advertising and Promotional Materials”: ATVEA members have also committed to strict rules regarding the advertising of their ATVs to promote the safe and responsible use of the vehicles and to avoid encouraging bad driving behaviour. ATVEA produced an ATV Rider Training film on DVD in cooperation with the European ATV Safety Institute (EASI). The ATVEA DVD clearly presents how ATVs should be used safely. The film has been translated in 23 EU languages and is disseminated occurs through the dealers’ networks of ATVEA’s members.